hope 4 freya - survived shark attack! 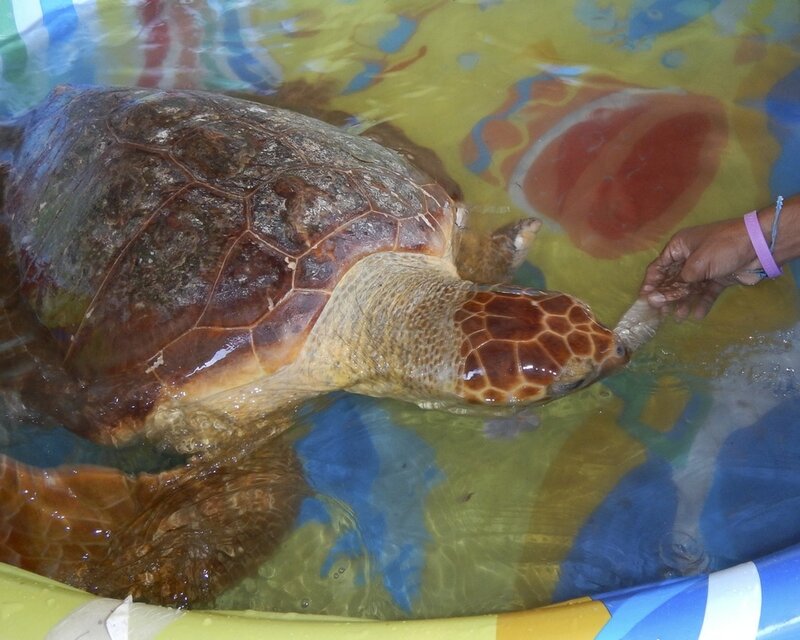 Freya, a subadult loggerhead sea turtle was rescued by Gilbert "Hilly Boo" Lara, from Freedom Fishing Tours, San Pedro, Ambergris Caye, Belize, while he was enroute to Belize City. 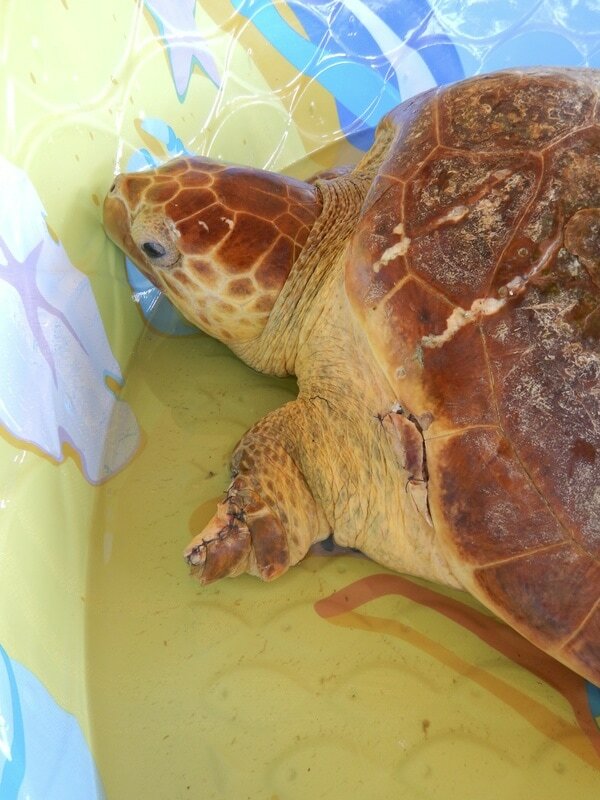 Hilly Boo observed birds picking on the sea turtle and noted that she was not able to dive down and escape the attack, so he picked her up and put her in his boat. 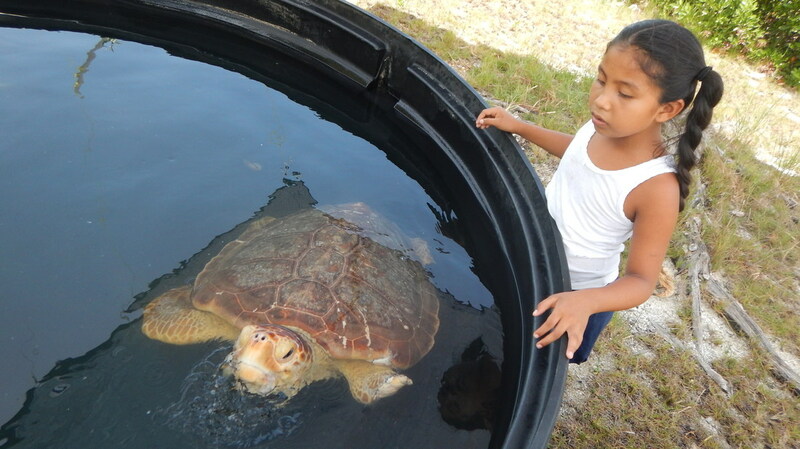 He contacted Hol Chan who contacted Fisheries in Belize City and contacted ECOMAR who picked up the turtle in Belize City. 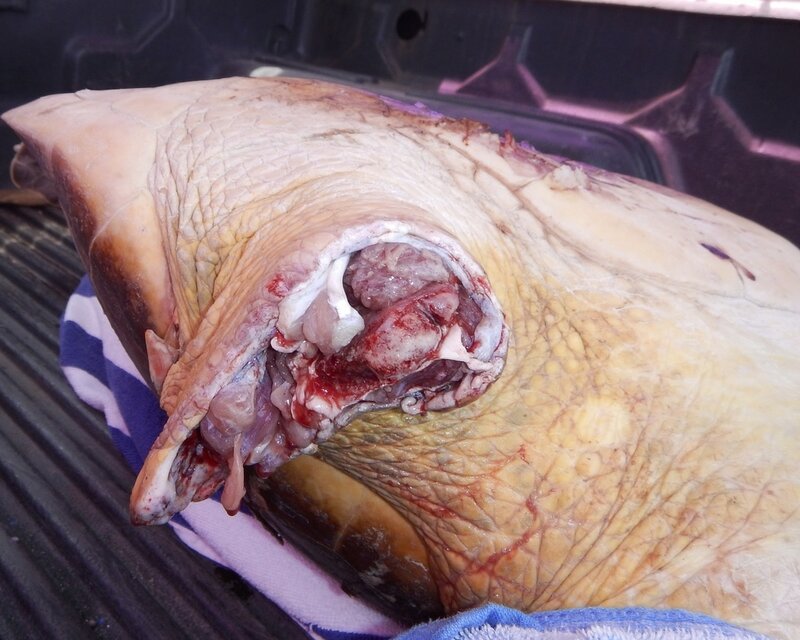 The turtle's left front flipper was severed and bone and flesh was protruding from the open wound and there were numerous scratches on her shell suggesting that she had recently been attacked by a shark. ECOMAR transported her to the Animal Medical Center where Dr Jayne Crawford stitched up the flipper lost to the shark. Her carapace and plastron were also scratched up as a result of the attack, but were superficial wounds. 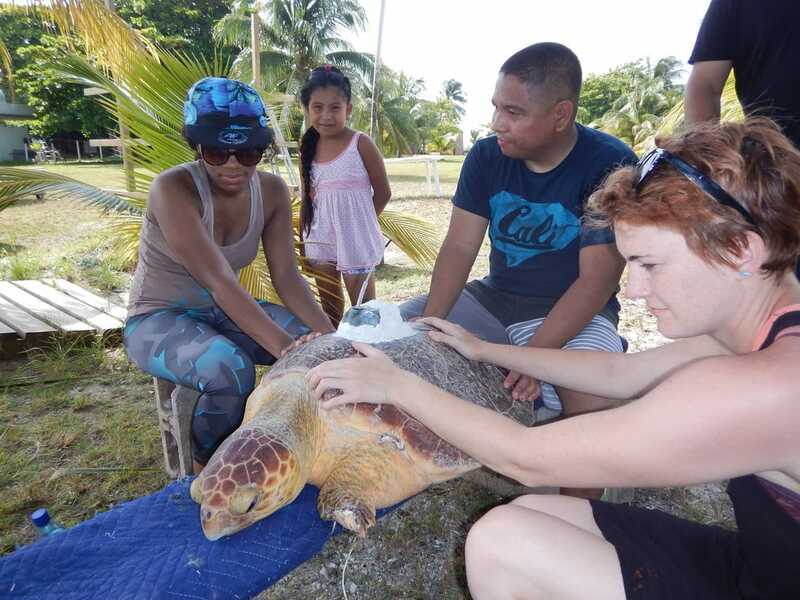 ECOMAR transported the injured turtle to the St George's Caye Research Station & Field School, which had an team of archaeology students on the island, who named the turtle after the Nordic mythological goddess of love, beauty and destiny. She was kept in a shallow pool upon her arrival and was monitored 24/7. On day 3 Dr Phillip Deshield made a visit to St George's Caye and checked on Freya's recovery and was pleased with her progress. On the morning of her 4th day she ate a dozen small fish and was moved to a deeper container where she demonstrated that she could dive down and stay at depth. Freya is migrating along the Yucatan Peninsula. Freya arrives at her foraging ground off Progresso, Mexico and will remain here for almost two years! We received a signal that Freya has left her honey hole off Progresso Mexico. Will she remigrate back to her nesting beach in Belize? Freya is migrating eastward along the northern part of the Yucatan Peninsula suggesting she may possibly be returning to Belize! A visiting student group from the New York Film Academy was documenting ECOMAR's research filmed the rehab, tagging and release and are to prepare a short documentary for their class project. One of the students also prepared a DIY project to apply a satellite tag. 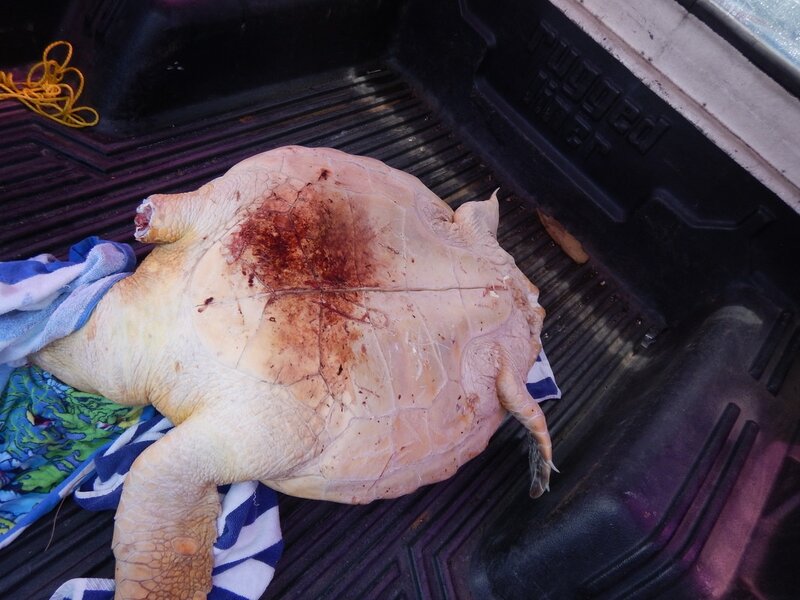 Freya is the first loggerhead sea turtle and the first shark attack survivor being tracked using satellite telemetry in Belize and the data from her migration path will be extremely useful in comparing her species migration to that of the hawksbill, and green sea turtles. It will also us to monitor her migration as she continues to recover and back in the sea missing her left front flipper! 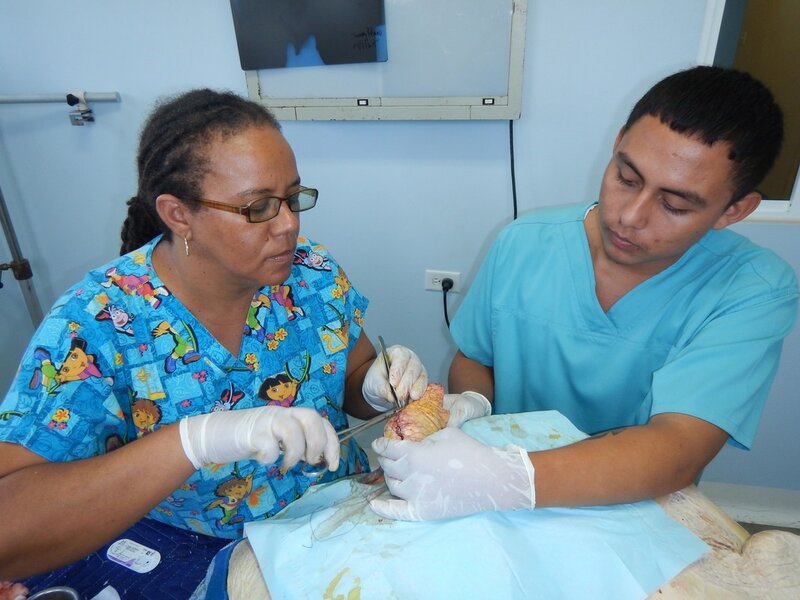 ​There is HOPE for FREYA thank to Hawksbill Hope, Marymount University and Dr Todd Rimkus for his support of sea turtle conservation in Belize. This Google Earth map has to be updated manually to show the most recent points.